If you need to administer formal course evaluations, Etudes provides just the right solution for your campus. We provide colleges with the tools to set up formal evaluations and add observers in sites efficiently. The process is anonymous and confidential for students, while protecting the rights of instructors. Below are the steps for administering formal course evaluations in Etudes. 1. Request a master formal evaluations site. To get started with the formal course evaluation functionality of Etudes, contact Etudes to receive a master “Setup of Evals” site. This special site has unique permissions that enable a designated “Coordinator” on your campus to set up and distribute formal course evaluations in any of your Etudes course sites. This site has just AT&S enabled, and a Formal Evaluations Manager tool. The Coordinator will never visit the instructors’ sites. The setup of evaluations is managed “remotely” from this master site. Please provide the employee id, name and email address of the individual who will serve this function. 2. Set up your formal student evaluation in your master site. Once your ‘Setup of Evals” site is established, go to that site, and create your student survey, using AT&S. One evaluation survey can be used for many sites. Set the survey as a “Formal Course Evaluation”. You can also choose to have the system notify students when the survey opens. To do so, check the boxes in settings. Scroll down and enter the email addresses of the individuals who should receive the results of the student surveys. The results will be emailed to these recipients when the due date is reached and the survey is closed. If you need to enter more than one email, separate them with a comma. You may set the open and due date. You may leave the survey unpublished. It will be published in the destination site, automatically, when you distribute it. It’s a good idea to leave it unpublished, so that it’s not locked and you can make more changes in the future, if you wish. Note: You will have the ability to adjust open / due dates, change the recipient email addresses, and choose to notify students (or not) during the distribution process. Please preview or test drive your student survey in AT&S to make sure your evaluations are ready before you distribute them. 4. Distribute your formal student evaluation to sites. Once your formal student evaluation is created, you are ready to distribute it to as many sites as needed. Click on “Formal Evaluations on the left menu. In the drop-down menu, select the term and the subject of the courses that you need to setup a formal evaluation in, check the sites, and click on Continue at the bottom. Note: If you need to set up evaluations in different subjects, you will need to repeat the process for each department. You may customize the title of the survey. It is how it will appear in the course site. Verify that the open and due dates are correct. Select whether or not you want students to be notified when the survey opens. Set all the email addresses of the individual(s) that should receive the results. Add the employee ID for each official observer that will evaluate the instructor (optional). Separate multiple observers with a comma. Note: If your observer does not have an official account in the system, contact Etudes. Provide their name, email, and employee id. 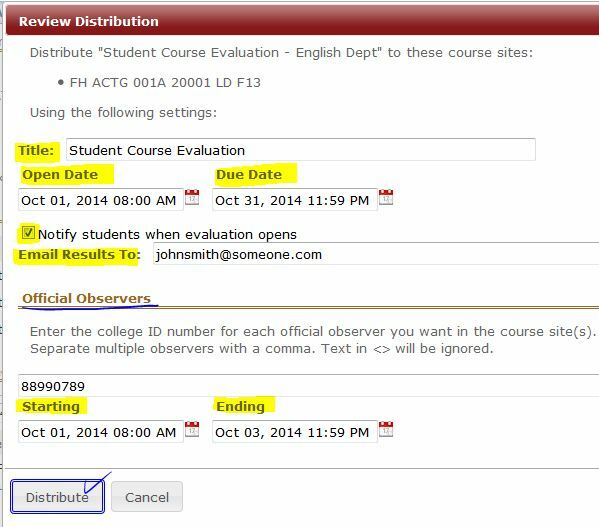 Add the starting and ending dates for the period that the observer(s) should have access to the course site(s). This is optional. The evaluations are now posted in the sites and you can see them on your main list. The green check indicates that the evaluation is published in the site. The icon with a person signifies that the survey is “live”. There are student submissions in it. Students will be notified when the survey opens, if you checked that option. The results will be sent to the recipients when it closes. When the evaluation closes, formal course evaluation coordinators can see the response rate of the survey, i.e. how many students completed it out of the possible number that could do so (enrolled). 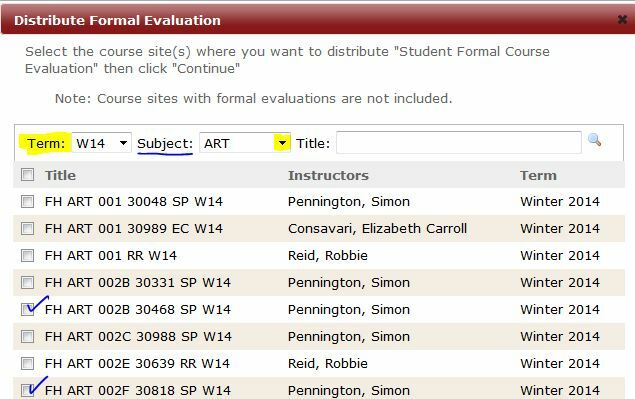 You can export the response rates for all the courses that were evaluated in a term by clicking on the Export button to the far right under Established Formal Evaluations. This allows you to export the response rates for all the courses that were evaluated in a term in one CSV spreadsheet file. Here is a sample file with the types of data that gets exported. What if you misspelled or forgot an email address, entered the wrong open or due dates, or forgot to add an observer? Click on the Edit icon to the left of the distributed evaluation, make the change, and save your changes. If you administer different surveys for different departments and wonder if the correct survey version was distributed in a particular course, you can click on the “preview” icon in front of a distributed survey and you will have the opportunity to preview its questions. At some colleges, observers can be added to course sites only for a specific time period for the purpose of the formal classroom evaluation. The Etudes Formal Course Evaluation Manager allows you to set starting and ending dates for the observers. You can do this during the distribution of formal evaluations, or you can add observers at a later time by clicking on the edit icon of the distributed student survey, entering the college ID number of the observer, and setting the duration of time that they should have access. Setting both dates means the observers are allowed into the site from the starting date until the ending date. ​Leaving both dates blank means the observers are allowed in the site at any time, if the site is published. Setting an open date only means the observers are allowed in the site once that date arrives, until the site is unpublished. Setting just the ending date means the observer is allowed into the site as soon as the site is published, until the ending date arrives. If you have set an ending date for the observers, they will be removed automatically from the course site when it is reached. Alternatively, when the evaluation period ends, you can remove the observer manually. Click on the Edit icon to the left of the formal course evaluation, remove the employee id of the individual, and save your changes. Instructors can also block observers from their sites when the evaluation window is over (in Roster). As the dates of the classroom observation can be different from the period in which students complete the course evaluation survey, you may add observers at any time, as long as a student evaluation survey is in the class. To add an observer in a site that was set up for formal evaluation, click on Edit by the site title and add the observer. The “observer” role is similar to the “guest” role. Like in the traditional classroom, the function of observers is to simply observe the classroom instruction. Observers cannot participate in discussions and cannot send private messages. They can view all discussions, including those closed or not yet open, and they can view discussions of private group forums. Individuals with the observer role cannot author, manage, grade, take tests, etc. The observer cannot access Activity Meter or the gradebook. Observers can access items that are closed, hidden, or not-yet-open to better aid them in having a fuller picture of the classroom instruction. Observers cannot see drafts or unpublished items, as these items may be work in progress. Observers can only be added to sites by Formal Evaluation Coordinators. A site must have a formal course evaluation published in it before you can add observers. Observers are listed in the site’s Roster with the “Observer” designation to clearly identify their function in the site. Instructors can see if an ‘observer’ has visited their course site in Activity Meter. They can see the date of their first and last visit and the total number of visits. When observers are added to a course, they get an email notification, informing them that they were added, and how to go about logging on. When observers are added to a course site, instructors are also informed via email that they were added, by whom, for which purpose, for how long, and what permissions they have in the site. What if you distributed a formal course evaluation to the wrong site, or distributed the wrong survey? No problem. Click on the “Delete” icon to the left of the distributed evaluation to remove it from the site. If the evaluation was not yet taken by any students, it will be removed from the site instantly. If one or more students had taken it, it will be ‘archived’ in the site (it will not get deleted), and will be removed from the active list of assessments. You can distribute a new version of the evaluation to the site. Only one formal evaluation can be published in a site at any time. Below is a sample email message with the formal evaluation results that goes out to the recipients. It will include your college’s questions. Recipients do not get student responses as they are submitted. All the responses are tabulated and are sent in one email when the survey closes. If for some reason an individual did not get the results, you can click on the email icon by the distributed evaluation to resend them. (See last column, labeled “Results”). You may also add an alternate email address. A formal course evaluation has been posted under Assignments, Tests, and Surveys in your Etudes course. This is a formal course evaluation, administered by your college. Your feedback is very important to your college, as they strive to offer high-quality courses and programs. Please take a few minutes of your time to complete it. It opens on Oct 1, 2014 8:00:00 AM and closes on Oct 31, 2014 11:59:00 PM. – Please be assured that the results are strictly anonymous, secure, and confidential. – Your instructor cannot access your responses. – The anonymous results will be emailed to the campus representative responsible for the evaluation. Thank you for participating in this course evaluation process. When a formal evaluation is distributed to a course site, the instructor receives an email notification from Etudes, informing them that a formal evaluation was added by the formal evaluations coordinator. Only “enrolled’ students (added to Etudes by your Registrar’s data) can take formal course evaluations. Guests, teaching assistants, observers, and manually-added students cannot take formal course evaluations. This is to ensure that only officially-registered students participate in the formal evaluation process. Instructors cannot edit, unpublish, or archive formal course evaluations, nor can they view results. Formal evaluation surveys are grayed out in the instructors’ view of AT&S, and they don’t appear in their grading views. Formal course evaluations do not participate in special access and don’t have allow until dates. Everyone must take them within the specified window. Formal course evaluations are not imported into future courses when instructors run ‘import from site’. Formal course evaluation surveys can be duplicated by a Formal Evaluations Coordinator (in the Setup of Evals site), for the purpose of creating a different version.